An Albany & Eastern freight approaches the Columbus Street pedestrian crossing back in January. Readers interested in rail transportation — and who isn’t? — will naturally be eager to review the draft of the 2014 Oregon State Rail Plan just published by the Oregon Department of Transportation. At 161 pages, not to mention the 100-page technical report, it takes patience to get through. But it includes some troubling facts, especially concerning money, and more especially the kind of money it will take to maintain, let alone expand, the Cascade passenger trains connecting Eugene with Portland via Albany, Salem and Oregon City. More about the passenger service below. But first, one of the tables in the plan ranks Oregon’s shortline freight railroads by revenue per mile of track in 2011. It’s an eye-opener because it shows how tough a business railroading is. The Albany & Eastern, for example, which operates on 72 miles between Albany, Lebanon, Sweet Home and Mill City, had total revenue that year of less than $1.8 million or $24,622 per mile of track. It handled 3,011 carloads, which makes for revenue of $586 per car. Out of that, the railroad had to pay its employees, purchase fuel and maintain rolling stock and other equipment, and keep its track in working order, plus pay insurance and local property tax as well as state and federal taxes. The other notable money angle in the plan concerns passenger rail, particularly the operations of the Cascade trains. ODOT has $19.3 million in funding for these operations this biennium, including $7 million from the sale of automobile custom license plates, but it anticipates a $10 million “shortfall.” The plan gives no clue how this hole is being covered, but it says the shortfall in “passenger operations and planning” may increase to more than $25 million in 2015-17. 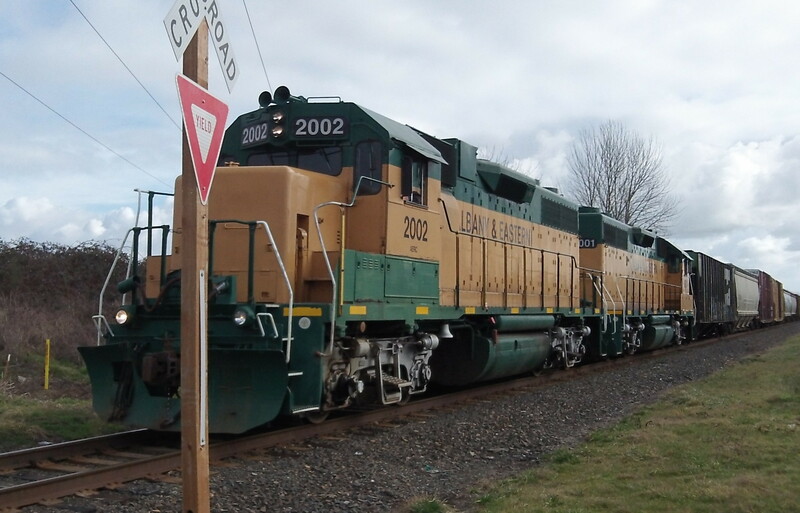 Oregon has no dedicated revenue source to back the state-supported passenger trains. A citizen might suggest charging the passengers enough to cover the cost, but that would make tickets so expensive that most train users would get back in their cars instead. Since 2011, two ODOT work groups have considered potential income sources to support passenger rail. Most notably, the recommendations include forming a taxing district from Eugene to Portland to levy a passenger train property tax. The legislature could form such a district and call for a tax election. But I doubt that voters would approve a property tax increase to support bistro service to Portland, especially if the increase would come out of the hide of local taxing districts because of tax compression. Meanwhile, remember that there’s a state task force working on an environmental impact statement to prepare for improved Cascade train service by vastly upgrading the line. In view of the money problems, that effort looks hopeless. You can look up the plan at www.oregon.gov/ODOT/TD/TP/Pages/railplan.aspx, which also tells you where to write if you’d like to comment on it. Hmmm, millions that are either being wasted or planned for by some magical future appearance. Sounds like the way our city government is run! Oh, wait! Sharon Konopa is on the Oregon Passenger Rail Leadership Council which helps make these monetary decisions! Sidewalks to no-where… trains to no-where… more and more debt heading our way… and Sharon’s name is all over it… imagine that! IF more trains were feasible, why are most of the daily routes served by a BUS? Because they know they can’t afford “real” trains! Buses have far more flexibility in case of disasters and could also EASILY include Corvallis like Greyhound did when they served Albany. I’ve taken the early evening AMTRAK “BUS” down from Portland 3-4 times in the last 2 years. At no time was even one of them 1/3 full. More typical was 10-15% capacity. One time there were 3 of us to start and 2 got off at Salem! There’s just no justification for a locomotive for a handful of passengers. ‘Although passenger rail is a ghost of its Northwest glory days, the Cascades corridor is the seventh most popular in the nation, with about 900,000 riders a year. Well Ray, I think your statistics are quite misleading. Oregon City to PDX may generate a lot of passengers, but a relatively low amount of passenger miles per passenger. I’m somewhat skeptical of the amount of passengers, since there is only one morning train @ 7:24 from Oregon city to PDX that would be useful for “day workers”. The next “morning” train to PDX is @ 11:15 a.m.